The Harmony 675 Advanced Universal Remote from Logitech is just that, a universal remote control. 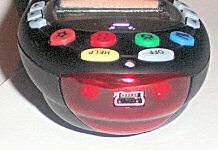 Instead of searching under sofas and cushions for all the different remote controls for your video/audio equipment, you can use this to program up to 15 different devices and also set up activities that will switch on equipment in order after pressing one button (for example, Watch Movie would turn on the TV, then the surround sound system, set them to the right channels and then switch on the DVD player and play the film). The remote is powered by four AAA batteries supplied, despite the box saying only three, and comes with three different coloured faceplates of silver, red and blue to customise your remote. These faceplates are extremely difficult to fit over the small rubberised buttons on the remote and it took me ten minutes to fit one on. The device has a small LCD screen (black and white on this model, but colour on higher models) that is permanently on, which displays messages and also gives up to six extra commands to your current device via the buttons on either side of the screen. Above that are the four activity buttons marked with icons for film, television, audio and a star (to access any other activities you have set up), an Off button (for the equipment, not the remote) and a Help button. This button seems to just display the message 'did this fix the problem?' when pressed, and then lists the equipment programmed to see if the devices are switched off. Below the screen are three buttons, Device (to select the device you want to control), Media (for use with a media player) and Next (to scroll through options on screen). You then have the standard VCR controls and below that a large OK button and menu controls (Exit, Menu, Info, Guide), four colour coded buttons, a volume and a channel rocker button, Mute, Back and Glow buttons (the latter turns on the back light feature to light up the buttons for a few seconds), and then a number pad. That's fifty buttons in total, not including the metal ring around the OK button which acts as a four direction joy pad for navigation. There's a sensor at the base of the control (used for teaching it commands from another remote), and a USB port at the front to connect the remote to your PC with the supplied cable, along with the infra-red transmitter. After I installed the client software on the PC, which must be done through a direct connection to a USB port and not through a hub, as I discovered, it sits in your system tray and is loaded when Windows loads by default. It then asked to go through to the Logitech Harmony website. In fact, every time you connect the remote to your PC, it will try to do this automatically. This is because you program the remote through the website using the client software and your web browser (and it only works with Internet Explorer, not Opera or Firefox). Your options and devices, button programming and everything is set through wizards on the website set up through a profile (so it remembers your devices), and when you update your remote, a file is sent to the client software which then updates the remote. This is around a 500k-700k file, and takes four to five minutes to update, after which it reboots the remote and asks you to test the settings you just made. The problem I had is that any change, no matter what or how small, goes through this routine, so you have to be on line to update the remote. Indeed, when I first connected, before I could go through the wizard to set up my devices, I was told that my software was out of date. The CD is supplied with version 4.2 of the client software, but the web page detected it as version 4.1 and insisted that I update the software to version 4.4 with a 23Mb download. This is not a product you can use with a dial up connection, especially as you have to be on line for so long to make changes. After updating the software and creating a profile I finally started to program the remote. The wizard lets you choose what type of equipment you have and then asks for a serial/model number. You must be accurate with this, as the database it accesses doesn't really allow for mistakes. I started with a couple of televisions (a JVC and a Hitachi), two DVD players, a Pioneer audio centre, two VCRs, a surround sound system and a Sony hi-fi. When it wasn't too sure of the device, it asked if I had the remote control, and then asks me to press the on/off button, a volume up control and then a number button to confirm that it had the right equipment. This is fine for most devices, but the surround sound system doesn't have numbers, so I had to cancel that part of the learning confirmation. It also can't cope if it doesn't know the device and you don't have the original remote. One of the Hitachi televisions I was programming is quite old (it doesn't even have a Scart socket) and the remote control perished some time ago. I had a replacement remote but when I tried it with the wizard it said that it was an invalid remote control and refused to be programmed. I emailed Logitech support giving details of my problem but I got no reply. The Harmony Remote Update Application receives the update file, created from your options, via a Java applet on the website. Once the file has downloaded, this pop up window appears as the data is sent to the remote control. The web page refreshes itself every so often while this happens. When the changes have been made, the remote control reboots itself, and the application sends a message back to the website. You can customise the commands assigned to any of the buttons on the remote for each device, and set up new activities (a series of button presses). I needed to do this quite often as the default settings for the devices were not right. My VCRs had odd custom buttons assigned (marked +E), some devices like my televisions had menu options for DVD input buttons (when the device doesn't have one) and most devices had separate on and off buttons assigned. Every device I use has one button that toggles the on/off, but Logitech seems to have assigned a separate custom command for each. With my DVD player the skip chapter buttons were not assigned at all, which was annoying as this is a common command. The worse offender though was a button marked Eject. As per the instructions, when the remote control is updated, you are supposed to test the equipment before coming back to your PC and clicking on the confirm button to say it works correctly. When I pressed the eject button, my Toshiba DVD player did not eject the DVD as expected, but reset itself to the factory defaults. I had to set the display to letterbox and the audio output options, but as my DVD player is multi-regional, it also reset it to a region 2 only player. For those of you who don't know, DVDs have a region code, where region 2 is for UK discs and other countries, and region 1 is mainly for US discs. This is independent of the TV format (PAL or NTSC in this case). I discovered that the region setting had been reset a few days later when I tried to play a region 1 disc which had worked before. The DVD player refused to play the disc, and only after a search on the web did I find the settings to change the DVD player back to region 0, which means it can play all regions. A less experienced user would have had tremendous trouble with this, and quite why Logitech have these mistakes in their database I do not know. I realise that there are hundreds of televisions, VCRs, DVD players, etc. but if you offer the database (which may be from a third party) to users of your remote controls, you should make sure that they work correctly. I found it frustrating that you had to be on line to make any change to your remote. Now I have a broadband connection so the telephone line is not engaged when I surf the web but I'm sure there could be an easier way to program the devices without the need to be on line all the time. If a program had its own database of devices then it would work off line, but it may need to be updated more often, and I don't know how large the databases are, so this may be impracticable. The display window is quite small, and when I customised the custom buttons for my newer Hitachi television, I set up three commands of On/Off, Scart (to switch to the Scart socket input) and Picture Mode (which enhanced the brightness and colours). The website allows me to make the changes with no problem, but the display shows Picture and then half an M, then On/Off and the Scart settings on the button below. If the display cannot cope with long tags for the commands it should mention this when you program them. The buttons on the remote are like the small rubber like buttons on a mobile phone, and just about the same size, which means they are quite small. Even with the glow feature to light up the buttons, some people (particularly those with poor eye sight) will have trouble with the buttons, and I found some were not very responsive. The range of the remote is very good though, better than the original remote control in some cases, although there is a delay with the button presses. 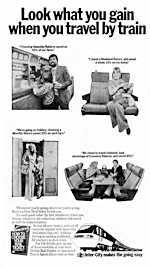 This meant when I was using the channel up button I pressed the button a couple of times more that I needed to as I didn't get an immediate response, and the television channel advanced beyond the one I wanted. 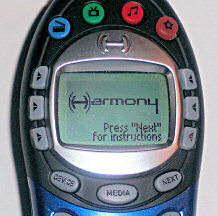 There are several models of the Harmony remote, and the top range one has a colour display. There is very little documentation included, and even though there was a printed copy of the manual for the 675, there was no PDF equivalent on the CD. 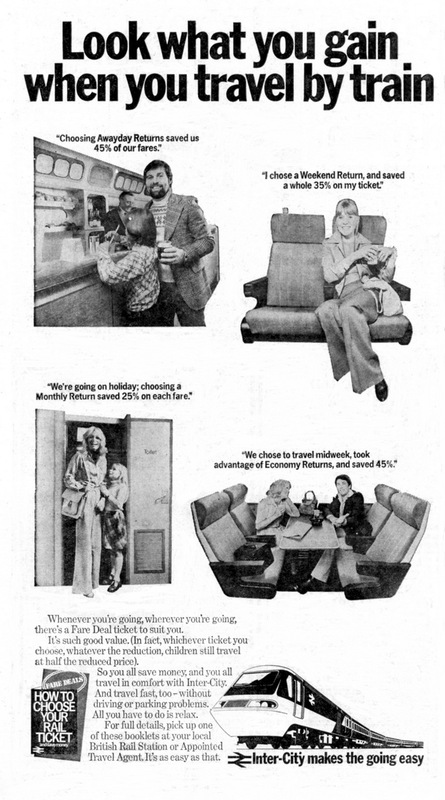 There was a PDF for the 655 and 688 models, but none for the 675 that was supplied. The activities are easy to set up, but accessing the different devices takes several key presses to access. If you program an activity which does not watch a film, watch television or play audio, it will appear in the activities list. To access this you need to press star, then Next, and Next again if it isn't one of the two displayed on screen, then press one of the side buttons to execute it. When you set them up, you can set the device for audio to be different to the video. If you watch a film for example, you may want to control the volume on your surround sound system using the volume control, but access the playback controls on your DVD. If you do not use the activities, then to change a device means pressing the Device button to show the devices in a list of three per page, pressing Next to get to the right page and then pressing the appropriate side button. This activates the buttons and the custom buttons, with the device name in the window. I cannot see why the remote's display has to be on all the time, as there is no time or date displayed. The screen remains on all the time, but when you use the Glow button to illuminate the display and buttons the light turns off after a few seconds. 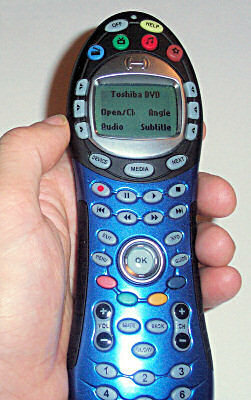 While the remote is fairly thin, the buttons are a bit too small and do not feel responsive. The installation procedure could be improved, and certainly if I had a dial up connection and I was forced to download a 23mb update before even setting up the device the remote would have gone back in the box and not used. The configuration on the web pages means you have to spend a long time on line although the wizards are well designed. The inaccurate default controls for the devices, the need to be on line to make any changes, the tiny screen, the need for several key presses and the lack of reply from support means I was disappointed with the Harmony 675. The small buttons and limited customisation means I will stick with my Pocket PC and the built in Nevo universal remote control software with 'activities' and fully customisable pages and learning for any remote control. I have now received an email reply from support, which had my name as Vic Anatra (I don't know why, as I used my name in all the correspondence and registration details). Anyway, they suggested that I ring them and I found that they are based in Toronto. After trying moving the remote different distances from the sensor, changing the batteries and even turning off the lights, I managed to get the remote to learn some commands from my replacement remote by using two remotes to fool the Harmony remote to learn the commands. This didn't help me, and after the Logitech engineers looked at the data, they said that the IR signals used in the Hitachi (replacement) remote is a carrierless type signal that cannot be learnt by the 600 series of the Harmony remote. Even if it is taught the commands, it cannot be transmitted because of the nature of the signal. This is due to the hardware on the 600 series and unfortunately, there is no fix for it. The newer 525 and 885 models can learn and send carrierless IR signals but Logitech only supplied the older 675 model.